We are located in Galax, Virginia across from Felts Park (Home of the Old Fiddler's Convention). Below you will find directions and a map on how to get here. If you are heading South on Interstate 77 take Exit 14 (Galax/Hillsville) and turn right on US-221 North/US-58 West. Go 10 miles and turn left on Meadow Street. Go 4/10 mile and turn right on Grayson Street. Go 1/10 mile and turn left on Railroad Avenue. Continue on Railroad Avenue for 4/10 mile and the RV Park & Campground will be on your left. If you are heading North on Interstate 77 take Exit 14 (Galax/Hillsville) and turn left on US-221 North/US-58 West. Go 10 miles and turn left on Meadow Street. Go 4/10 mile and turn right on Grayson Street. Go 1/10 mile and turn left on Railroad Avenue. 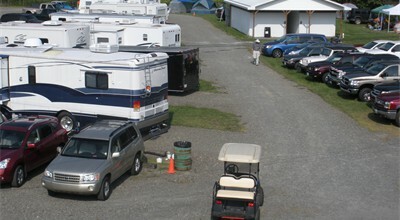 Continue on Railroad Avenue for 4/10 mile and the RV Park & Campground will be on your left. Travel Highway 89 North into Virginia. Go 6.9 miles and turn right on Fair Street. Go 463 Feet and turn left on Railroad Avenue. 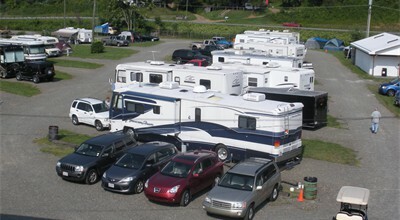 Go 1/10 mile and the RV Park & Campground will be on your right.